Who needs European Employment Rights? We all do. 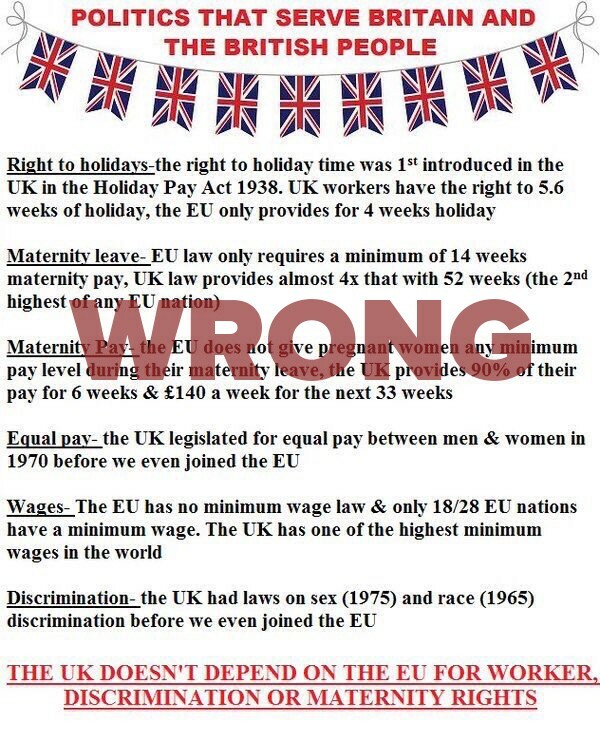 The Holidays with Pay Act 1938 did not create a general right to paid holiday. It applied only to those workers who had their minimum wages set by a wage regulating authority (section 1(1)). Any worker whose pay was fixed under the Trade Boards Acts 1909 and 1918 or the Agricultural Wages (Regulation) Act 1924 were not to be entitled to more than a week’s paid leave in each year and the former were not to be allowed to take more than three consecutive days of leave (Section 1(2)). The Directive created, for the first time, a right to four weeks’ annual leave for all employees. In 2010, the European Parliament (that bunch of ELECTED Eurocrats) voted in favour of a series of amendments to the Pregnant Workers Directive 92/85/EU. These provided for, amongst other things, 20 weeks’ maternity leave on full pay. MEP Nigel Farage described the vote as “foolishness”. The meme has been very careful to avoid mentioning any of the wide variety of protections that are wholly European in origin such as those for part-time workers, fixed-term workers and agency workers. It also ignores the other protected characteristics added to discrimination law as a result of Europe. If you would like a full picture of “what Europe has done for us”, I recommend Michael Ford QC’s impressive and exhaustive account (link below).